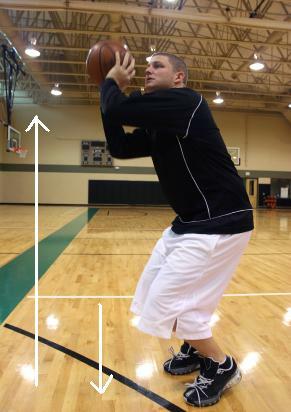 The jump shot is the same as shooting the basketball, only jumping up and releasing the ball in the air. Perfecting and mastering it will pay off in spades. 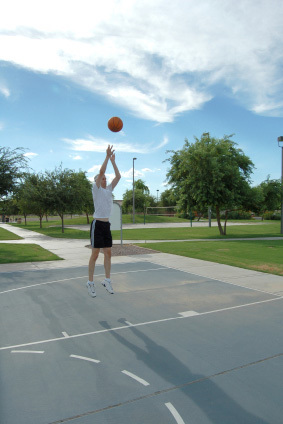 Its a difficult shot to block since you're shooting the ball at an elevated point. Picture someone hopping up on a pogo stick; you must go down to build momentum before popping up. With your feet shoulder width's apart, right foot slightly in front if you're right handed, bend your knees slightly. Now this is all going to be one SMOOTH motion. You won't be bending your knees slowly or keep them bended. Go up in the air as you raise the ball over your head. Release the ball AS you're going up, but near the peak of your jump. If you release it at the apex or while you're going down, gravity will working against you. 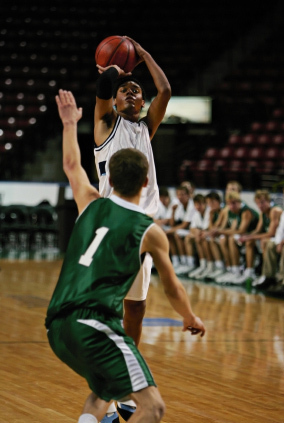 In game situations, you can catch(the pass) and shoot. Take a quick dribble, stop, and POP. Jab step or pump fake in the triple threat position, then let it fly. You see, having a reliable jumper adds a whole new dimension to your game.